You could say it was a fun filled weekend of bringing parrots places... The first outing was with Kili the Senegal Parrot, and the second was with both Kili and Truman the Cape Parrot. These were done to maintain socialization skills with Kili, and develop socialization further in Truman. Michael and I took Kili to a recent homecoming football game/alumni reunion event. We arrived at the homecoming game near the very end but just in time to see the home team�s victory. We stuck around on the school's field for snacks and socialization for Kili after the game. She was very comfortable and calm in her flight harness on Michael's shoulder with crowds of people in every direction. The temperature outside that afternoon was a bit chilly. Kili was snuggled into the collar of Michael's light jacket with her head poking out to shelter her from the occasional breeze. Some of the school's faculty, alumni and students attending the events spotted Kili and handled her. She eagerly performed tricks, said hello, and seemed to enjoy being the center of attention. 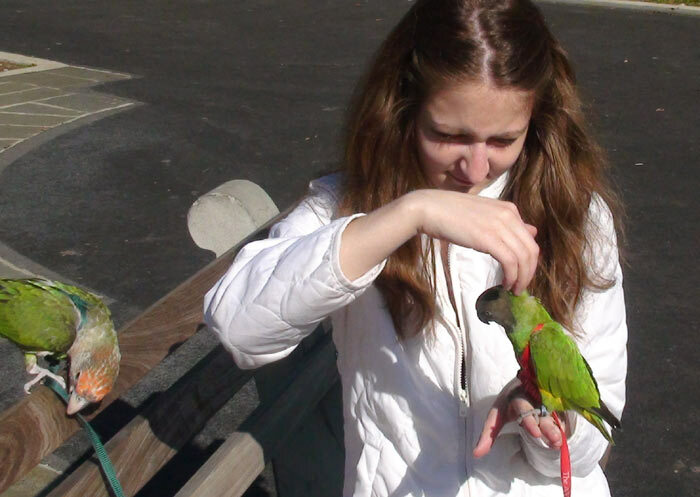 The following day, Michael and I took both parrots outdoors to a park. Kili had been fed pellets in the morning in her cage so she was not significantly food driven, but Truman had only been offered pellets in his carrier and had not eaten much. 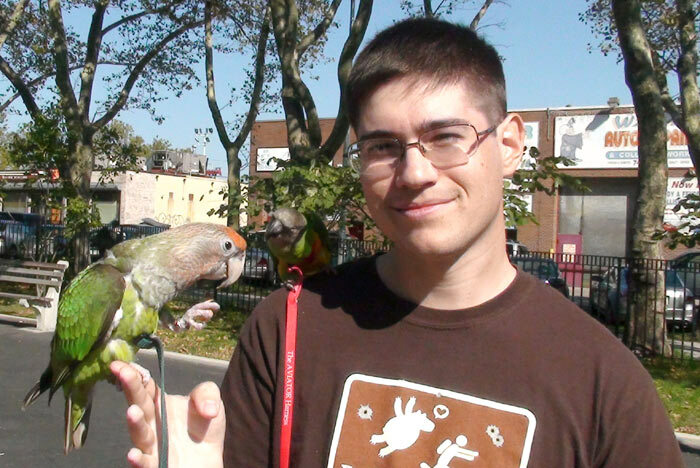 We started the experience by walking around the park area with Kili and Truman, looking for members of a wild flock of Monk Parakeets in Brooklyn. We walked around to two different communal nest locations for 10 minutes and listened for the distinct calls of these parakeets. We heard their shrieking and we knew they were near by. Amazingly, we spotted five or six of them flying together. We stood and watched some land in a tree across the street and then watched a few fly to their nest. When the activity died down, we headed for the playground a few minutes walk away with Kili and Truman. What started as just a socialization experience at the playground became a trick and recall session, especially with Truman. Some children and adults at the playground gathered around and watched us with the parrots. Truman was screaming and shrieking loudly in excitement. Kili and Truman demonstrated a few tricks and harness flight recalls, and the parrots seemed to enjoy all the attention and showing off for the crowd. Truman was highly motivated at the park and showed improved recall reliability with Michael. He seemed more motivated in the presence of the crowd. We finished up at the park and were walking out when Truman became highly vocal and excited on Michael's shoulder. He learned to mimic a catcall and clicking sounds from Kili's vocalizations, and we finally caught it on video. Truman is currently maturing and is developing beneficial outdoor, social and coping skills. He is acquiring a positive association with being inside of his carrier because Michael and I are offering him meals, treats and toys inside. However, Truman was not fully comfortable eating in his carrier and his carrier training is still incomplete. Kili is already socialized and has become more accepting of being outdoors, new people and changes. As a result, being outside with us in new situations and meeting strangers are meant to maintain her skills. However, Kili is highly aggressive in her territory and defends her cage, perches and trees from anyone but her perceived mate, including Truman. It is beneficial to bring a territorially aggressive parrot to unfamiliar or neutral territories and introduce a perceived intruder to a parrot who has displayed this kind of aggression. This type of interaction can help to improve a relationship and increase confidence in both the parrot and the person. Kili is more willing to step up for me away from home because I am more familiar to her than the surroundings. Furthermore, both parrots benefited from spending time outdoors. Prolonged direct sunlight exposure is important for vitamin D and calcium. Harness flight training outdoors helps to prepare for the event that either parrot is lost outside. In order to avoid serious behavioral problems including stress, aggression, and fear toward new people and new objects, prevention is best. In the wild, baby and juvenile parrots would learn skills from their parents, such as what is food, where to find food, how to eat food, what is dangerous, what are predators, flock dynamics and social skills. As pets, parrots rely on their breeders, hand feeders, caretakers, and owners to teach them skills so they can thrive in a domesticated environment. 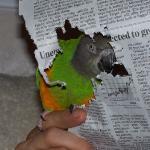 Exposing your parrot to new things will prepare it for more significant changes in the future. Introduce your parrot to new people, objects and places. Always create positive experiences and pay attention to your parrot's comfort level. Reward the parrot for tolerating or experiencing new things to avoid creating phobias. Make being inside of a carrier rewarding with a meal, treats, or a toy. Take your bird to an enjoyable and safe environment so it becomes accustomed to traveling in a carrier. Teach your family and friends how to properly handle and interact with your bird. Set up positive reinforcement scenarios for socialization with other people with trained tricks or other behaviors. Teaching a parrot socialization and coping skills is essential in order to own an overall healthy and confident pet. Great advice, as usual. Thanks to both of you. Nice to see you again Kathleen.